Color: frequently colored by impurities and then may be any color, most chalcedony used for ornamental purposes is colored by artificial means. Cleavage: Cryptocrystalline quartz shows no cleavage, although parting may occur along layers and splintery fracture can develope parallel to microfibrous orientation. Chalcedony is a cryptocrystalline variety of the mineral Quartz (SiO2). Quartz is the most abundant single mineral on earth. It makes up about 12% of the earth's crust, occurring in a wide variety of igneous, metamorphic and sedimentary rocks. The cryptocrystalline varieties of quartz may be separated into two types; fibrous and microgranular. Chalcedony is the general term applied to the fibrous cryptocrystalline varieties. Agate is an example of a fibrous cryptocystalline banded chalcedony, a variety of quartz. Carnelian, Chrysoprase and bloodstone are other chalcedony varieties. 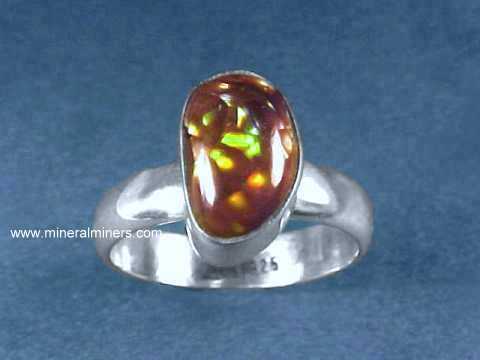 Opal is a hydrous silica mineral composed of SiO2 with some water incorporated within its structure. Agate is a variety of chalcedony, which is the general term applied to fibrous cryptocrystalline quartz varieties. Chalcedony is a mineral generally of secondary origin, forming in cavities and veins by deposition from meteoric groundwater containing gelatinous silica from the weathering of silicate minerals. It can also form by deposition from late hydrothermal solutions at or near the earth's surface under conditions of low temperature and low pressure. 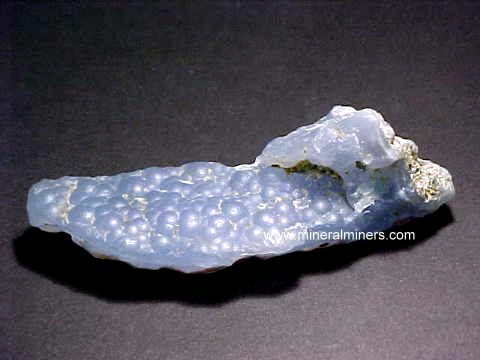 Chalcedony is commonly associated with siliceous volcanics, occurring as vein or vesicle filling. It occurs as a petrifying agent in fossil wood and bone. 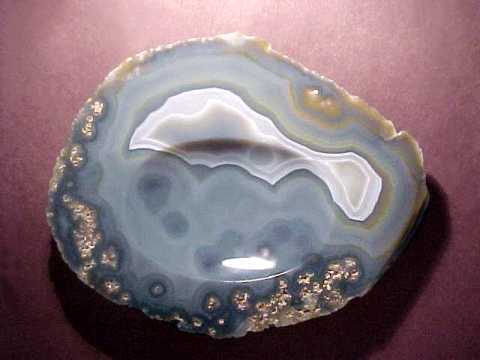 Chalcedony is frequently found lining or filling rock cavities and fissures, sometimes forming geodes. 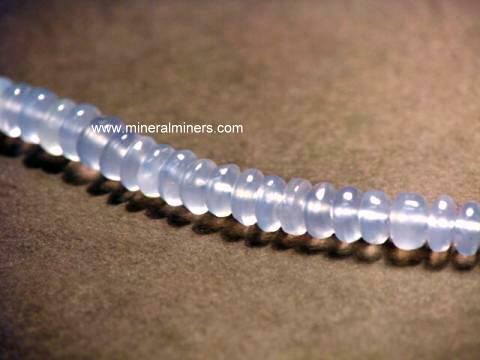 Chalcedony is characterized by its occurance, hardness, fracture, specific gravity, refractive index and luster. 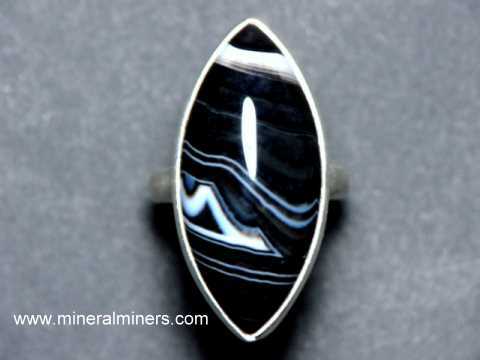 The name agate is from an old locality on the achate river in southwestern Sicily. Some chalcedony varieties have been named for specific colors such as carnelian for orange-red chalcedony. Chalcedony varieties have also been named for patterns or inclusions present in the chalcedony such as lace agate, fire agate, banded agate, and moss agate. Chalcedony has been used as gemstones and other ornamental objects for thousands of years. In medieval times, the wearing of agate was said to bring God's favor and make one agreeable and persuasive, giving victory and strength to the wearer and protection from all dangers. Wearing agate and chalcedony was also thought to give pleasant dreams and cure insomnia. Early Greeks made amulets of agate for protection from the elements of the sea. Some of the earliest primitive stone tools (axes) fashioned by man's ancestors 2.5 million years ago in the Omo valley in Ethiopia, were made of quartz varieties such as agate, chert and chalcedony. These materials were used because of their hardness and their isotropic brittleness which made it possible to shape the tools with relative ease. The astrological signs of chalcedony are Sagittarius, Cancer, and Capricorn. Chalcedony is a birthstone for the month of March. Chalcedony is a symbolic gemstone for the 12th wedding anniversary. Chalcedony is said to provide balance between one's physical, emotional, intelectual and spiritual states. 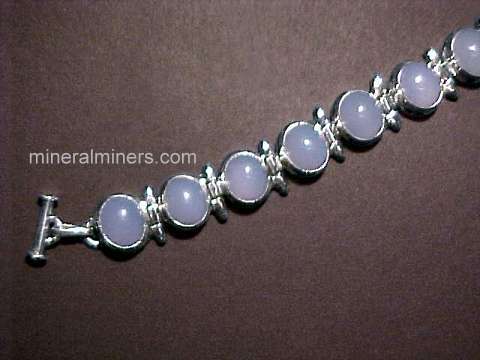 Chalcedony is also said to alleviate hostilities and promote goodwill. Chalcedony is said to help treat disorders related to senility and dementia. This is the end of our Chalcedony Factsheet and Information page.